There?s a new vantage point in Ottertail city. From atop the observation tower being built at the old creamery, visitors will be able to take in many of the sights the small city has to offer–including a view of seven area lakes. 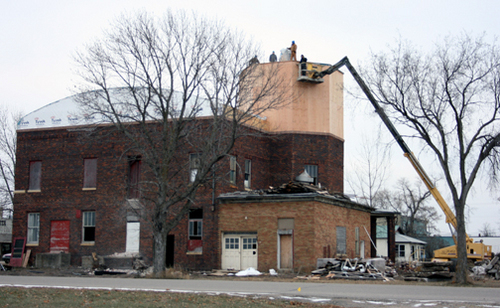 The tower is being constructed on the south side of the historic Ottertail creamery building, originally constructed 1921. Throughout the years, the building has had several owners and has been used for everything from a slaughterhouse to a used tire business. In April of 2006, the Ottertail-based Firestarters Ministries bought the property. For the past two years, the group has been working on clearing out the decades? worth of debris that had accumulated inside. Construction on the building officially began this fall. The group?s current plans are to use the creamery building to house storefront shops, a coffee shop, and a concert hall. The possibility has also been considered of converting the upper level into apartments. Heading up the construction of the facility is Pete Thiel, who presented some of the ministry?s updated plans for the building at a Nov. 20 city council meeting. According to Thiel, the well house is in place for the building and the 24 ft. by 24 ft. octagonal tower is in the construction process. When finished, the tower will include an observation deck with a handrail on top. Thiel said he is also considering putting a gazebo-type covering over the existing tower. Although Thiel said he originally planned to construct a concert hall facility on the south side of the existing creamery structure, those plans are on hold for now. At least for this winter, the plan is to continue to work on the inside of the old building. ?This should keep you busy all winter,? commented Ottertail city clerk Linda Bjelland, after the council approved a zoning permit for the ministry to continue working on the interior of the creamery building. With this fall?s addition of an arched roof, the building will be sealed and protected from the elements for this coming winter. The temporary plan is to build the concert hall in the existing building, a space which will also serve as a meeting location for the ministry. As Thiel presented his plans for the concert hall at the council meeting, several council members were hit with a little nostalgia. Councilmember Arlette Carlson mentioned how she used to have piano recitals and plays in the second level of the creamery building. Mayor Raymond ?Ole? Mounts also recalled some fond memories singing in the old building as a child. Another local, Ottertail mechanic Delmer Wiebe, has spoken of days gone by where he played accordion on the old stage in the creamery. ?One of the things we?d really like to see is people coming back to the building and playing again,? Thiel said of his desire to give the city?s musicians a venue to play their instruments in once again. ?It?d be great to have open mic nights or something like that.? With the ministry?s goal to make the old creamery a type of community hub, many are eagerly anticipating the opening of the old brick structure. Whether it?s fond recollections or excitement about future opportunities the building will bring, the restoration of the landmark creamery is a welcome project for many. ?It looks great,? councilman Don Patrick said, addressing Thiel. ?We really appreciate what you?ve done with the building. It?s incredible.? The Ottertail Creamery building along with the St. Paul House restoration projects have touched many lives in the local community, across the nation, and around the world. Thank you so much for your generosity and support that helps us to continue to build toward our vision for a brighter city. Contributions to Firestarters Worship Center are income-tax deductible to the extent permitted by law and are made with the understanding that Firestarters Worship Center has complete discretion and direction over the use of all donated funds. Thank you so much for your gift.